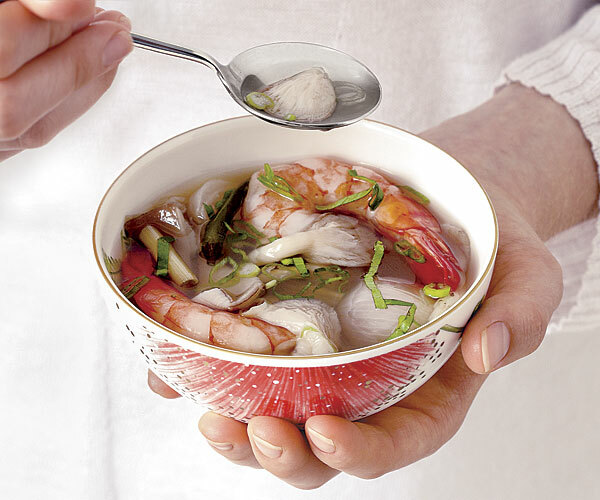 Thai food expert Andy Ricker shares his recipe for an intensely flavorful hot-and-sour shrimp soup. On cold days, it’s hard to resist the call of tom yam soup from my local Thai takeout. Filled with juicy shrimp, fiery chiles, bright lemongrass, and woodsy galangal, it warms me to the bone. Wanting to make it myself, I asked Thai food authority and James Beard Award–winning chef Andy Ricker if he’d be willing to share his recipe and some information about the soup. This is a weeknight dish—once you gather the ingredients. Andy stressed that cooking this soup is quick and straightforward. The broth adds depth to the soup, although it does take longer to cook and requires still more ingredients. But he was clear that it’s optional. “In Thailand, not everyone can afford to use pork,” he said, adding that water is a good substitute. The shrimp, chiles, and herbs take care of the flavor. 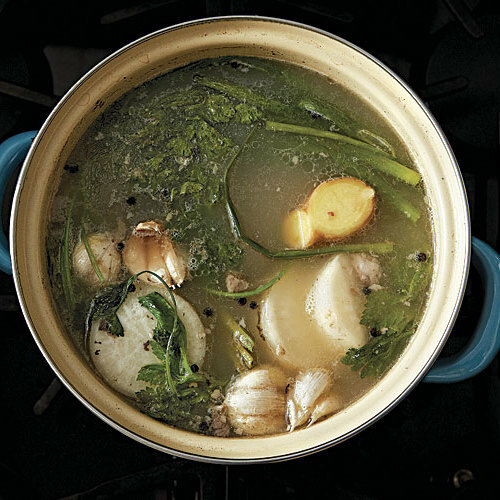 I asked the Fine Cooking test kitchen to make his recipe with and without the pork broth and was smitten with it both ways: Its burst of tartness, punch of chile heat, and complex herbal flavor were bold, yet nuanced and balanced. Then, knowing that not everyone has a good Asian market nearby, we went rogue and tried it with substitutions for some of the harder-to-find ingredients (sorry, chef!). And you know what? It was still really tasty. At home, I’ve bucked tradition even more and had a big bowl for dinner, without rice, because it’s just that good. 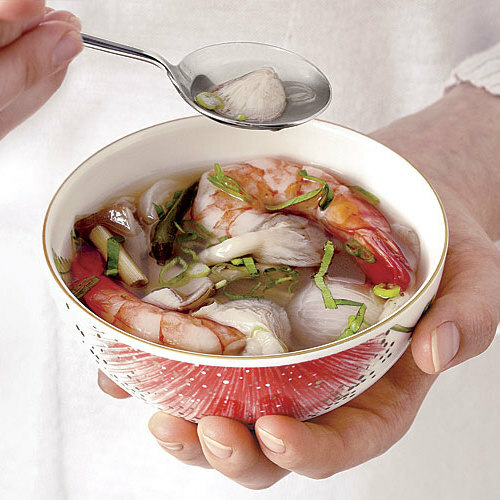 Tom yam kung gets its distinctive flavor from several ingredients common in Thai cooking. If there’s no Asian market nearby, you can mail-order, or substitute for some of them. Cilantro root is deeply earthy with a mild cilantro flavor. Chop cilantro stems finely if you can’t find roots. With their potently fresh and slightly floral aroma, wild lime leaves are a Thai food staple, but you can approximate their flavor with lime zest. Asian red shallots have less water than the more common European ones, so they add bold, sweet, oniony flavor; the European kind make a fine substitute. Galangal root lends spicy, aromatic, citrusy notes. It’s a cousin of ginger, which can be used in a pinch. Sawtooth coriander, also called culantro or aprium, is a fresh herb with a strong coriander flavor. Cilantro can be used in its place. Green Thai chiles are grassy and very hot; ripe red ones are a little sweeter. If you can’t find either, use slightly milder serrano chiles. Lemongrass has an intoxicating floral, lemony flavor without the acidity. Luckily, it’s become easier to find at grocery stores. Tender oyster mushrooms have a clean, delicately earthy flavor. They’re widely available in grocery stores.